James Spann has the forecast to start the short Thanksgiving work week from Alabama NewsCenter on Vimeo. QUIET WEEK: We started off the day with a fair sky and temperatures in the 30s and 40s at daybreak. We project a high between 62 and 65 degrees for most communities today with clouds slowly on the increase. A cold front will pass through the state tonight, and it looks like there will be enough moisture for a few showers along the front; rain amounts should be generally one-quarter inch or less. The best chance of showers will come from about 7 p.m. through 3 a.m.
TUESDAY/WEDNESDAY: Tuesday will be mostly sunny and cooler, with a high in the mid 50s. We will drop into the 28- to 32-degree range by early Wednesday morning. The day Wednesday will be nice and quiet with a sunny sky and a high in the mid to upper 50s. For those traveling Wednesday, much of the continental U.S. will feature dry weather. Rain is likely along the west coast from Seattle down to San Francisco, and some snow is possible over parts of New England. But, for most of the major U.S. airport hubs, we see no weather issues. 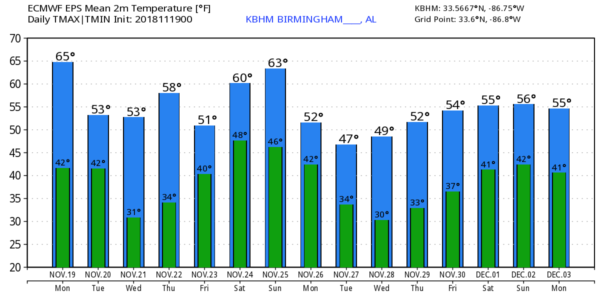 THANKSGIVING DAY: Sunny weather continues for Alabama thanks to a dry air mass. We start the day in the 30- to 35-degree range, followed by a high in the upper 50s for the northern half of Alabama, with 60s for the southern counties of the state. FRIDAY AND THE WEEKEND: Clouds will increase Friday, and a disturbance will bring rain to the state Friday night into Saturday morning. 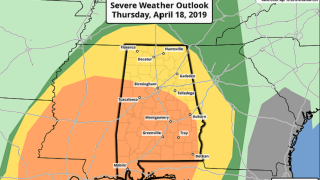 For now it looks like the main chance of rain will come from 6 p.m. Friday through 9 a.m. Saturday; a few thunderstorms could be involved, but the risk of severe weather looks low, with little to no surface-based instability. Rain amounts of around 1 inch are likely. Some clearing is possible Saturday afternoon, but another wave will bring the chance of some light rain to the state Sunday. The high Saturday will be in the low 60s, but Sunday will be cooler, with a high in the 50s. IRON BOWL: For now it looks like the rain will be over in time for the 2:30 kickoff in Tuscaloosa at Bryant-Denny Stadium. Some clearing is possible; we project a kickoff temperature around 63 degrees, falling into the 50s by the fourth quarter. We are still several days out and the forecast could change. NEXT WEEK: The first half of the week looks cool and dry, with highs in the 50s and lows in the 30s. Long-range model data suggest some risk of rain could return toward the end of the week. TROPICS: The Atlantic basin remains quiet, and the season ends at the end of the month.